The combination of a Wide-Band O2 sensor and comprehensive Display Gauge is the ultimate tuning aid provided it is both accurate, and easy to use. 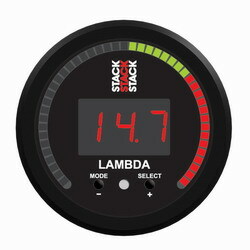 The STACK ST3401 kit is both in one- and at a competitive price! Get STACKs legendary quality and accuracy in a quick install universal gauge kit and begin monitoring Air/Fuel mixture at all times!